Is An Awning Worth It? Answer: Yes! 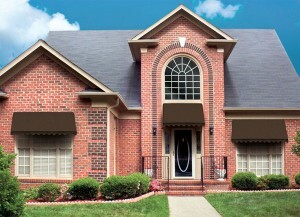 Awnings are a phenomenal investment in your home or business, your comfort, and your happiness. why should you get an awning? Awnings are a phenomenal investment in your home or business, your comfort, and your happiness. That might sound like a dramatic statement, but we promise we’re telling the truth! We have seen the delight that high-quality awnings can bring firsthand and love to share that happiness with all of our customers. Why are awnings so great? Awnings add more living and entertaining space to your home without the stress of major construction. You can customize the area to your liking and invite guests over on a sunny summer day without making them sit in the sun. No more scrambling for an umbrella whenever it starts raining! Instead, you’ll entertain comfortably and happily outdoors. Adding an awning over your patio, deck, or backyard will also increase the value of your home. Since they add livable space, they add a little extra to your home’s value. They also add a great deal of curb appeal for any homeowners that are looking for outdoor space where they can enjoy fun in the shade instead of fun in the sun. Did you know that awnings can lower your energy costs? Awnings, when correctly installed and maintained, will decrease the amount of direct solar heat that enters your home through windows. Adding an awning to your home can lower your summer cooling costs by a whopping 25%. If you use a retractable awning, you could save during the winter months as well, since they will help the sun to warm your home and lock in heat after dark. The sun is a dominant heat source and source of ultraviolet rays. Adding an awning to your home will also prevent the sun from fading or damaging your furniture, both inside and outside. The sun can fade expensive investments like hardwood flooring and carpeting if you allow it to. An awning can protect your skin and your home from harmful ultraviolet rays.